This is Joaquins brother! I did this as a xmas present for a friend of mine. 6B graphite on A4 printer paper. I tired and failed at doing a pencil version of this - you did a brilliant job!!! Oh my god, dude!! 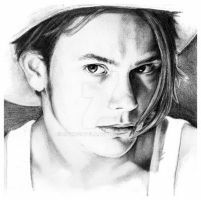 I never realised you have drawn River, too!! You're my hero!! wow...its idinticle to the real photo. so I'm adding this to my favs. Great ! Now we need Joaquin ! Amazing. The shading and the detail are both stunning. WOW! a lovely drawing - really lovely choice of photograph. This is beautiful work Amazing! this is amazing!! you are really talented! it looks exactly like him! Omg! I was checking your gallery with the question in my mind "would this person maybe do a River portrait if I asked him to.. that would be a challenge".. and then I found THIS! Wow, thanks. I definately will fav+ this one. I think River is one of the most difficult one to draw because of his piercing eyes. Wow thats so cool! Glad you like it. Well thankfully his eyes were mostly in shadow so it wasnt as much of as challenge. How do you pencil artist manage to make such a detailed and complicated works, without filling the white paper with a cloud of graffite-dusty finger prints? Im amazed that it is even posible! Haha rt on . Being that I'm 33 I'm thinkin ... hehe no ,no Joachim is the shadow, River came first. This is absolutely fantastic. Incredible likeness (not that I ever met the guy, but you know! Woow, River .. Great work ! WoW! You never ceese to amaze me! it's so life-like! Great job! Love the hair! looks just like him...great style too! this is really great. everything is proportionate and the value scale is gorgeous. awesome job on this ( i didn't realize they were related, lol ) the eyes very well done, very deep set eyes he had. great job! The hair is excellent, so big and realistic! The shading on his face, well his whole face in general, is also fantastic. Really great piece. Wow, beautful. Kinda missed your new stuff, so good to see it. Great shading and expression. really great! you're able to capture expressions in a stunning way, yet keeping your style so loose. cool! very life like .